After lengthy planning sessions with the landscape designer, we settled on an octagonal mews design that would be unique and aesthetically pleasing. With many revisions and internet searches, it was difficult to find anything close to what we were looking for, even to be able to adapt to the mews requirements for raptor housing. It seemed that we were heading in the wrong direction when my sponsor left me a message on my VoiceMail indicating that someone had posted a note in the Website forums. 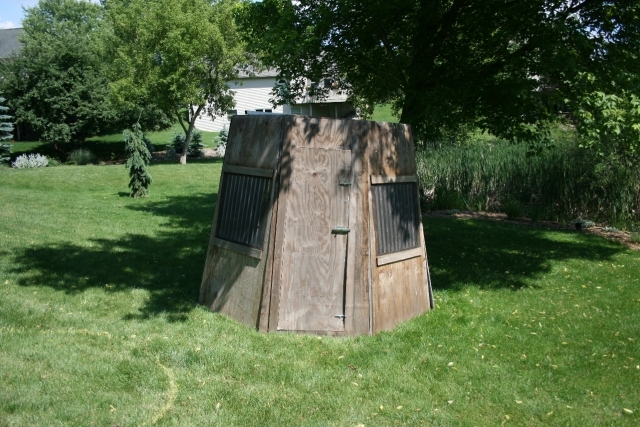 The note indicated that a previous falconer had an octagonal mews that they wanted to *give away* to a good home. Wow, sometimes the Lord works in mysterious ways, and this was a true gift that I couldn’t pass up. I called up the owner and arranged a time to come pick it up. While the wood is not in the greatest of shape, the basic design was pretty solid. I brought the mews home, stored it under the deck on the patio, and began planning for the base and other things we’d need to get this octagonal mews constructed properly. I spent about an hour on Saturday afternoon, putting up the mews in a flattened grassy area so that I could get an idea about how big this object would be after placing it in the back yard. The first, initial assembly is pictured above. With 8 x 4 foot sheets of plywood, and a few angled cuts, this little mews went up pretty quickly. The sides are 8 foot tall, producing a footprint of approximately 9 1/2 feet by 9 1/2 feet; about 80 square feet. The slight inward angle only puts the height of the mews just shy of 8 feet high. While the roof is not present in this picture, a simple, flat-board roof will be the temporary roof for inspection purposes. In order to make the structure blend into the garden landscape, we’ll need to design a sloped roof with proper surface to compliment the placement in the back yard. I needed to create a footprint that had enough space around the mews to walk on and provide about an extra 18 inches around the perimeter. 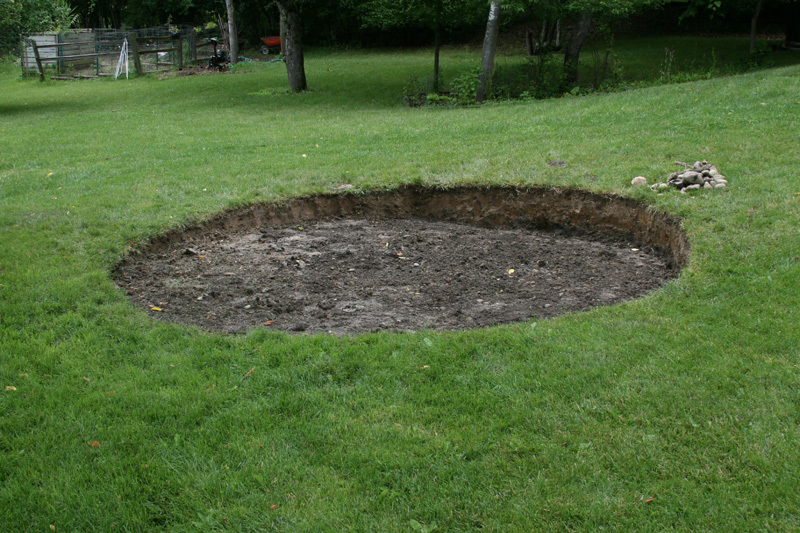 So with some string and a stick, we measured a nice circle in the lawn and began to dig. Removing the sod took a bit of work, and then a few loads of dirt with the wheel-barrow were removed for leveling. This picture above is the completed leveling phase of creating a nice base with a drain and some patio pavers. I’ll need to put down some slag-sand base for the pavers, and then place the brick pavers around in a circular pattern. Stay tuned for the next phase of the mews!